Stanford student-athletes must balance dual responsibilities: their academic coursework and their sporting commitments. While some believe student-athletes are held to lower academic standards than their non-athlete peers, both coaches and academic advisors alike say they work to promote a culture of academic rigor and integrity amongst student-athletes. Elizabeth Price ’18, a member of the women’s gymnastics team and a biomechanical engineering major, estimated that she spent about 20 hours a week on her sport on top of 30 to 40 hours of school work during fall quarter, when gymnastics was not in season and she could take a heavier course load. According to Price, performing at a high level academically and athletically can be challenging during her sport’s season, as her classes and gymnastics commitments tend to conflict. She said that she sometimes has to miss classes to travel and occasionally misses practice to attend office hours, adding that her time to focus on homework is severely limited during winter quarter due to weekend competitions. Expressing frustration, Price said that non-athletes are often unaware of the “balancing act” that student-athletes have to maintain to keep up with the academic pace at Stanford while devoting time to their sport. Melissa Schellberg, director of academic advising services for student-athletes and resident fellow in Suites, explained that academic planning can be uniquely difficult for student-athletes given that their schedules for practices and games are often decided by multiple stakeholders, including the NCAA conference, their coaches and their captains. Similarly, Greg Meehan, head director of women’s swimming, agreed that there are “absolutely pressures associated with being a student-athlete,” emphasizing that he prefers the hyphenated term to just “athlete” because it captures the dual role that student-athletes play. Some students contend that they must balance comparable extracurricular commitments without the added academic benefits that Stanford’s varsity athletes enjoy. Alex Sowell ’18, a national powerlifting competitor, also has to balance his athletic commitment with his academic ambitions, though Stanford does not recognize him officially as a “student-athlete.” Also an electrical engineer major, Sowell spends an estimated 15-20 hours a week on his sport and another 30 to 40 hours on his schoolwork. “I have to give time and commitment to one in order to do well in the other one. They can’t really coexist optimally, but it’s still worth doing both of them,” Sowell said. Powerlifting is not a Division I collegiate sport, so Sowell believes he misses out on the extra academic resources and accommodations afforded to varsity athletes, such as additional tutoring, deadline extensions and travel funding for competitions. Through the Athletic Advising Research Center (AARC), student-athletes are able to access additional resources to help them balance their dual commitment to academics and sports. Student-athletes meet often with their designated academic advisors to plan their class schedules around their athletic commitments and to ensure they fulfill the academic requirements necessary for graduation. Axel Geller ’21, a member of the men’s tennis team, recalls adapting his academic schedule several times to attend a competition in China which would require him to miss a week and a half of classes. “I changed my schedule five times for that to work,” he said. Price also remarked that her advisor is well-versed in the NCAA academic eligibility requirements and can help student-athletes navigate the challenges of fulfilling their academic obligations. For instance, student-athletes must always enroll in at least 12 units per quarter. For juniors and seniors, six of those units must count towards their degree. Depending on the quarter, athletes can receive up to two units for participating in their sport. Both Geller and Price stated that their coaches also influence their academic decisions. Likewise, Price remembers receiving advice as a freshman on how to adjust to a new academic environment while playing on a college team. To help his swimmers cope with the stresses of their academic and athletic demands, Meehan also encourages them to compartmentalize. In contrast to athlete advisors at other colleges, such as Cornell and the University of California at San Diego, the AARC advisors do not work under Stanford Athletics or report to the Director of Athletics. Instead, they are housed under the Office of Undergraduate Advising and Research. Meehan argued that this structure helps create a culture of academic integrity within athletics. In this way, the advisors at the AARC help athletes mediate between the conflicting demands of their professors and coaches. They don’t pledge allegiance to either academics or athletics, but strive to be a positive advocate for whatever is in the best interest of the student-athlete. She added that in the past, this role has involved supporting athletes who decide they want to discontinue their sport. Schellberg reported that since 2011, when Stanford Athletics decided to stop publishing a quarterly “courses of interest” list (the list was widely believed to enumerate easy classes for athletes to take), the AARC has changed its advising strategy. Schellberg acknowledged the AARC’s regret for publishing the list and believes that their new strategy of “targeted advising,” which she defined as tailoring advice to the values and goals of each individual athlete, has brought about positive change for athletes. The absence of a list doesn’t mean that student-athletes aren’t still looking for easier courses, though, Schellberg said. Carta is a website that allows Stanford students to review information about any given course, including the average number of hours students spend on it per week, grade distributions and written feedback. Meehan expressed frustration with the misconception that student-athletes at Stanford pursue an easier academic path. Data collected in 2017 suggest that the most popular major choices amongst student-athletes differ slightly from those of the whole student population. Science, technology and society, human biology, management science and engineering, computer science and political science, in that order, are the programs student-athletes most commonly pursue. 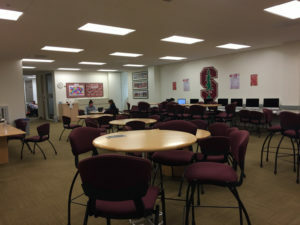 The most common majors across the entire Stanford community are computer science, human biology, electrical engineering, symbolic systems, and mechanical engineering. Meehan said that he fosters an emphasis on coursework by “culturally prioritizing academics” and impressing upon his swimmers the value of performing well in school. Meehan added that the team achieved its highest average G.P.A. over the past two academic quarters following their March 2017 national championship, attributing his swimmers’ academic successes to a “laser focus” developed in training that carried over to their school work. According to Schellberg, Head Coach of Women’s Lacrosse Amy Bokker also rewards academic achievement by hosting a special dinner every quarter for team members who achieve a G.P.A. of 3.5 or higher. Schellberg acknowledged that the high demands student-athletes face both academically and athletically sometimes require a tradeoff regarding where they choose to focus their energies. The NCAA reports that the probability of a student-athlete competing in their sport professionally is extremely low. In major professional sports, fewer than 10 percent of NCAA athletes embark on a professional career. For example, just 1.5 percent of college football players are drafted into the National Football League. Meehan believes that these statistics debunk myths that some non-athletes believe about the career prospects of their sporting peers. Geller, who won the Boys’ Doubles title at the 2017 Wimbledon Championships, hopes to return to Wimbledon in the future to claim the men’s title. While he strives to achieve his athletic goals, he has also made an academic plan to prepare himself for a career in economics or finance after he retires from tennis. Price has had her sights set on a career in engineering since she entered Stanford and retired from international elite gymnastics. Schellberg expressed her hope to eventually demystify college sports and bridge the gap between Stanford’s students and student-athletes.